By all accounts, yesterday’s Celebrate Allandale picnic was a success! The rain held off until it was over making for a very comfortable day in the park. It was just a relaxing afternoon spent with neighbors. People enjoyed a nice selection of food from Blue Star Cafeteria, Dog Almighty, Phoenecia Bakery and Sarah’s Mediteranean Grill. We appreciate their contributions. Also, thanks to Amy’s Ice Cream who was scooping out the ice cream. Cold water was supplied by Johnson Properties. Watson, Leann Atherton, and the Weary Boys. They made it truly special. brag about bringing together such talent. far outweighs the conveniences and low prices. See our photo gallery of the picnic here. And then go here to see even more pictures taken by Eric Glover. picnic but want to contribute to the Allandale Legal Fund, you can do so here. Committee and to the volunteers who came out yesterday to help out. Feel free to leave us your comments about the event. 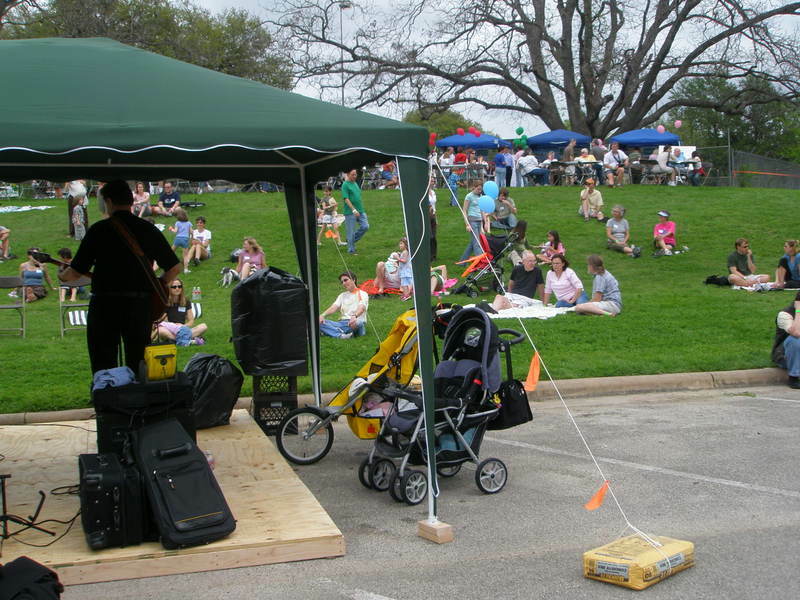 There’s discussion about making Celebrate Allandale an annual neighborhood party. I didn’t go because the lawsuit has zero chance of success. While I oppose the Wal-Mart, it is a waste of money to sue. The city followed their rules. A lawsuit only serves to waste money by giving it to lawyers. I’ll come next time. Hopefully the ANA would be motivated to throw a great party to truly celebrate Allandale and not just because they don’t like Wal-Mart. Thank you for putting together a great event. Other cities, like Davie, Florida most recently, have proven that the people have the final say in how their neighborhoods grow. Right here in Austin, such plans by developers have been thwarted repeatedly. We have a tough opponent, but the stakes are higher for all of us than they are for them. We will win if we all work together, stay engaged and never surrender. I am proud to be your neighbor. No need to make ugly comments. Maybe you should have come to see Phyllis, our neighborhood heroine, who helped thwart the four-lane highway right through our neighborhood at Far West, so many years ago. Do you see a highway? Nooooooooooooo! Thank God for people like Phyllis and the people still fighting today to preserve the integrity of our lovely Allandale community! Thanks for including us, we really love being part of Allandale. Thanks to all ya’ll who came out and ate some Amy’s Ice Creams, we are are donating the entire proceeds back to the neighborhood.